Showing results for tags 'hawkesbury'. First time poster.... Does anyone know if there's a limit on boat length and tonnage to use the NPWS public moorings in Ku Ring Gai National Park, in Cowan Creek north of Sydney? G'day everyone!, My first post on here just wanted to ask for some advice. In a couple of weeks some mates and I are hiring the 'skinny' from Hawkesbury Afloat from 8 am to 12 noon it only has a little 9 hp motor (see details below) so we can't venture too far from Brooklyn. Any help is greatly appreciated as it has been a long time since wetting a line. I bought 3-5kg 6'6 Shimano Catana and a 2500 size reel with 8lb braid. Main questions are where to fish I grew up in Newcastle and have never fished the area so not sure of any spots. Also I'm thinking of targeting Bream, Flathead and Tailor or anything that will give me some fun. I'm not sure what to use softplastics/bait/lures. If you could suggest a proven bait or soft plastics setup I would be very grateful! Thanks in advance PS: I'm happy to receive a PM if you don't want to publicise any advice. "Skinny" - 19ft (5.9m) twin aluminium hull "Skinny" recently had a total refurbishment and is now ready to hire. 1 x 9.9hp (4 stroke) Yamaha outboard with forward steering Full sun cover and cushioned seating Flat carpeted floor and good size esky Fishing licence for 4 people included There is NO BBQ on this boat. Bring along salad and a roasted chicken - a lot easier than a BBQ. Maximum persons permitted on Skinny is 6. Hi all, Took a mate out for an adventure, just the two of us ladies for an overnight trip. Epic is the only word to describe it. Left Easter Sunday afternoon packing pretty light, if we didn't catch fish, we were eating toast so the pressure was on. Out to my favourite spot off box head and it didn't disappoint, flathead for dinner and an amazing sunset with a beer or two - very cool. Anchored up near the rip bridge but after catching sharks, gave away the fishing in favour of the ukulele. Short ride out to broken bay on Monday morning but felt like we were sitting in a washing machine so back into the Hawkesbury in the hunt for a Jew. No Jew this time but ended up with flathead, a 40cm blue nose bream, hair tail and more flathead. Fun times with a special childhood mate who loves the adventure as much as me. No photos of the fish (alive) this trip. In the last couple of weeks its like someone has turned the switch on in the lower Hawkesbury River. I've abandoned my winter habit of chasing sleepy lizards in the deeper holes and hit the flats. Flicking 3 inch gulp prawns on a 1/8 jig in less than 3 ft of water at the top of the tide has been embarrassingly successful. A flathead on every retrieve, some ferocious tiddlers, but some good sized crocs mixed in. Areas with a gentle current running across patchy sand/mud and weed is the go. The really cool thing about flathead fishing in very shallow water is the way they fight! Once hooked it takes all your effort to keep them in the water (rod tip down). Had them jumping like bloody trout on Saturday afternoon. A quick two hour sesh resulted in 30 lizards, largest 65 cm, all returned to fight another day. The deep holes are still fishing well, but a plague of Soapies (20 - 45 cm) - whilst fun to catch, are a bit annoying because I would really prefer to hook onto their bigger brother. The little Jews must be pretty hungry because most times they have swallowed the plastic making it very hard to remove without hurting the fish. Prawns seem to be starting a little early this year and this lines up with the flatties preferring prawn plastics in the past couple of weeks over the traditional jerk shad. Tight lines! No keepers today, but thought others might be interested in what the lower Hawkesbury was like on Friday before the long weekend. I put the boat in at Akuna Bay about 8:30 this morning and picked up Dad off the train at Brooklyn. The water in Cowan Creek and up at Brooklyn is still quite murky, so headed down towards the mouth. After coffee, the first line in the water was about 10 down around Juno Point. It's was quite deceptive because the surface freshwater was moving slowly seaward but deeper was still racing in. We only had medium to light gear and the wind started getting up from the north, so we tucked in behind the point at the sport and rec camp. Got several flathead that were just below legal so they all went back. Next stop was just east of Patonga where much of the same. The water down here was looking much clearer. Headed over to flint and steel just before high tide where a few boats were setting up. Tried for a while but no luck. Probably could have waited until the run in finished, but I had a new light weight rod all rigged up, so headed up to the back of Jerusalem Bay. Quite murky up there - on the flats the sounder said we were in 1.5m but could have been in 100 for all you could see. Anyway it was a good chance to try out my new rod. I expected to get at least one flathead near the drop into deeper water, but instead several undersized whiting. Dropped Dad back to the train then zipped back round to Akuna Bay just before dark. Anyway, it was cracking good weather and a great day out with Dad, even if it is meat pies for dinner tonight! Good luck to everyone over the long weekend. Cheers, Brett. Hi Raiders, First time post, long time fishing tragic. I switched from bait a couple of months ago and I am just getting the hang of targeting specific species on plastics, vibes and blades. No more bait fingers and a better understanding where the fish are holding have resulted in some fun sessions and some good feeds lately. On Saturday morning took the tinnie out with the kids and we drifted for flathead along the narrow Mooney Mooney channel North of Spectacle Island. Landed lots of fun undersized spikies, but managed to keep 6 nice Duskies 40cm to 60cm for a feed. Managed to hook a big girl (over 1m) , got her to the side of the boat and she did that big head shake and said goodbye - off to breed another day! (would have returned her anyway). 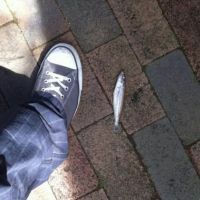 The swift Hawkesbury current and flukey winds can make it difficult to select the right jighead weight but we must have got it right this time. 1/8 TT jigs with curly tail 3 inch grubs in a funky purple colour did the trick. 15lb flouro leader on 6lb braid. The 15lb leader wasn't enough to stop the big girl though! Fun times with the kids! 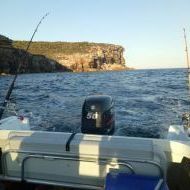 Hi Raiders I'm hoping someone can assist with any possible locations to host an annual fishing weekend, this year I am hoping to secure a place on the eastern side of the Hawkesbury River (Preferably with car access) and private jetty. Last year we went to Soldiers Point where I received and shared some great info from Scratchie and others in private messages and turned out a great and productive weekend. My main aim is to book a place with a private jetty which is extending into deep water (Anywhere 3 hours or less from Newcastle will do) however upon calling many places there is a reluctance to book if it's for 4-6 males (Even though we are getting old and love our sleep). Has anyone else had similar experiences or can suggest any places? (Private message is OK if need be). The reasoning for the suggestion of the Hawkesbury is the possibility of landing a jew - of any size. 25 Years fishing and I am yet to land one despite my nickname being Rex. HELP!! Last day of the holidays before going back to work and the weather was too good not to be out on the boat fishing! Had planned to be launching the boat at 6:30am. At the boat ramp at Parsley Bay about 6:50, so not doing too bad. Launched the boat then realised we didn’t have a reverse gear, as a result of some home DIY boat motor repairs the day before. Spent almost the next hour stuffing around with it trying to fix it before giving up and deciding to head out without a reverse gear. We fished the flats around Dangar Island on the run in tide. Picked up a nice 50cm flathead and plenty of small (undersized) bream and snapper and soapie jewies. Things quietened down for a while as the tide turned before a bit more action when the tide started running out. Tricky conditions as although the tide was running out, we kept drifting into the flats. Ended up with another 45cm flatty and a good 34cm flounder. I was so stoked to finally catch a good sized flounder. Lost another large flatty at the boat due to a netting mishap, sent back a 28cm bream and had several good runs that didn’t result in hook-ups (probably more soapie jewfish). Topped it off with a nice blue swimmer. There’s nothing like the anticipation when pulling in the crab traps, and then that excitement when you get the first glimpse of a shadowy blue lump in the middle of the net J Had intended to head down to the Vines to go for some bream, but we’d already had enough in the boat for a good feed for the two of us, so headed back in early enough to sort out the problems with reverse gear. (The problem turned out to be that we hadn’t put the motor into reverse gear before disconnecting the shift rod when dropping the lower unit of the motor to flush out the water cooling system – a tip for first time boat owners trying to do their own maintenance on a 25yr old two stroke!). So all up, we fished the Dangar Island flats on both the incoming and outgoing tide. All fish taken using prawns. Crab traps were set just outside the mouth of Porto Bay using tins of catfood as bait. Sat down to a nice meal last night of blue swimmer, grilled whole flathead, and bbq flounder. The flounder was absolutely delicious! Hope to catch more of them that size! Speaking to some raiders at the soft plastics workshop, I came to realise that many are experts in this river system and was hoping for some tips / advice. Going out in 2 weeks... Last time I went out in the Hawkesbury on a houseboat I tried some of the recommended spots such as the rail bridge with no luck. I basically ended up spending most of time at the public mooring near Little Jerusalem Bay (photo attached). In the mornings I was into some Tailor (mainly undersized) but at night I was generally live baiting with yellow tails and must have had 5-6 runs a night that would eventually cut me off shortly after setting the hook. I only managed to convert one of these to a 70cm Flathead; till this day I am not sure what kept cutting me off. Any ideas? Public moorings just seemed so much less hassle than anchoring, although I don't mind either for a good fishing spot. This time, it's just me and my wife (her first time). I was just looking forward to some tips from any raiders, good spots, etc. Still chasing that first Jewie and I know this river system still holds a few decent fish. Any tips would basically be great....thanks.